Original recipe: Coctos deraso cortice ex oleo et aceto ac melle iucundiores esse certum est. Translation: When scraped and cooked in olive oil, vinegar and honey, cucumbers are without doubt more delicious. Cut the cucumber into thick slices. Pour the white wine vinegar, olive oil, and honey into a heavy pan and cook the slices of cucumber gently in the sauce until they are tender, shaking the pan occasionally to redistribute the cucumber slices and ensure even cooking. Resist the temptation to add more of the liquids than the recipe calls for at first. 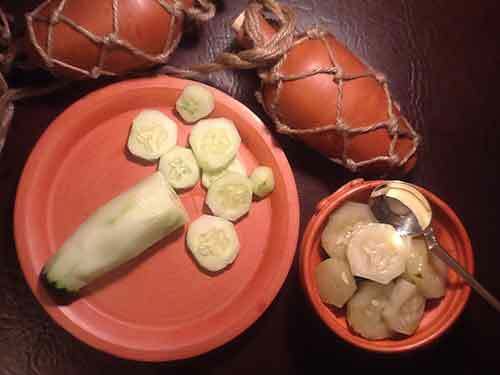 The cooking will pull a lot of juice out of the cucumber, and you can end up with the slices swimming in a watery sauce. This recipe has been tried with both peeled and unpeeled cucumbers; the peeled version, as described by Pliny, is definitely better.